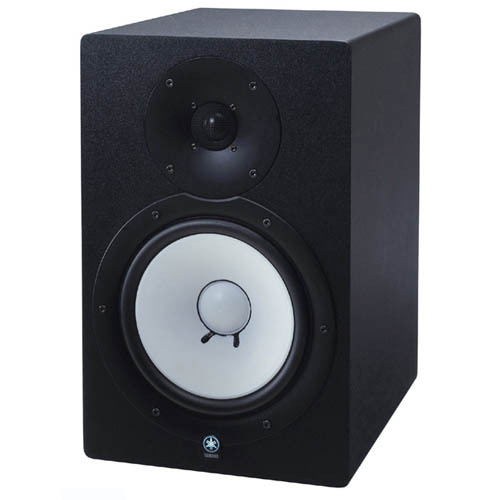 Yamaha’s new HS80M powered monitors were designed to be true studio reference monitors in the tradition of the famous NS10Ms. When choosing your next pair of near field reference monitors, remember it’s not just important that they sound good – they have to be an honest reference for your mix. The new HS80M reference monitors were designed to give you exceptionally flat response so you can really trust what you hear. That means that mixes that sound good on Yamaha HS80M speakers will sound good on anything. In fact, that’s the ultimate test of a reference monitor. The HS Series is a two-way, internally powered speaker system designed to provide affordable, high quality reference monitoring for all types of recording and multimedia applications – home studios, computer-based music production, gaming systems, keyboards rigs and personal computer systems. All products are sold and packaged individually, making it easy to build flexible monitor setups and 5.1 systems. The 120-watt HS80M (8-in. cone and 1-in. dome tweeter) is housed in a bass reflex-type cabinet and reproduces surprisingly tight low end and smooth, high frequency response to beyond 20kHz. Inputs include a balanced XLR and 1/4-in. phone jack. In addition to master level controls, each speaker has trim switches that allow you to custom-tailor low, mid and high frequency response for different applications. HS Series cabinets look as great as they sound. Enclosures are constructed of high-quality MDF material and a multiple layer finish that minimizes resonance. Design elements include a black finish and lighted Yamaha tuning fork logo. White polypropylene woofer cones recall the look of the classic Yamaha NS10M, and include low-damping rubber surrounds and full magnetic shielding.